Super Mobility Week (Booth #2644) – 3M Communication Markets Division today announced two new Slim Lock Closures for wireless weatherproofing of smaller RF connections at the cell site. The 3MTM Slim Lock Mini and the 3MTM Slim Lock Nano join the 3MTM Slim Lock Classic, creating a family of varying sizes for wireless weatherproofing needs. The closures offer a re-enterable weatherproofing solution that installs in less than a minute using just one hand, helping to reduce time and simplify install for tower hands. More information on the new Slim Lock Closures can be found on 3M.com/Wireless. Recently named a finalist for CTIA’s Emerging Technology Award, Slim Lock Closures protect signal integrity by blocking out moisture at both the antenna and Remote Radio Unit (RRU) in tower and roof top installations. The newest releases support the wireless industry’s move toward using Mini-DIN and N-Type connectors on Multiple In and Multiple Out (MIMO) antennas and radios for LTE deployments. The new Slim Lock Mini and Slim Lock Nano Closures, utilize the same innovative technology as the original Slim Lock Classic 716. 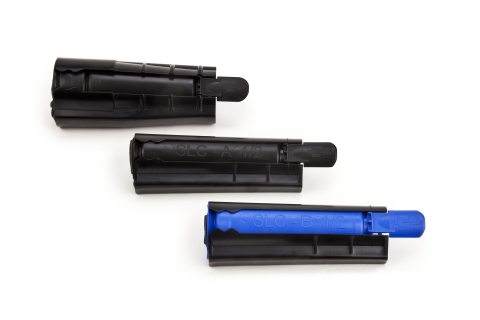 Through quick and easy one-handed installation, the conformable gel pad solution inside each Slim Lock Closure surrounds the connector and cable, displacing the air completely and creating a robust sealing interface. The new closures also incorporate the same application of the 3MTM Glass Bubbles technology to make them re-enterable and re-usable, limiting signal interruption and replacement costs. In addition to the original Slim Lock Classic (SLC-716) that can be used with standard DIN 716 connectors, the Slim Lock Mini (SLC-A-MINI) and Slim Lock Nano (SLC-B-NANO) work with a variety of Mini-DIN and N-Type connectors, in conjunction with nominal half-inch coaxial jumper cables. All Slim Lock Closures have been thoroughly tested in extreme weather conditions and meet the industry-standard IPX8 rating for water protection. The new Slim Lock Mini will be ready to ship in October 2014. The Slim Lock Nano will be available in winter 2014. The Slim Lock Closure is a CTIA Emerging Technology Award finalist for the category of Wide Area Network – RAN. CTIA will announce the winner during Super Mobility Week on Sept. 10, 2014 at the Sands Expo & Convention Center in Las Vegas. As a world leader in communications technology, 3M is a Network of Networks connecting products, people and companies by harnessing the power of 45+ technology platforms to create customer-centric innovations. The Network of Networks connects smart buildings to smart phones, datacenters to desktops, greenfield to brownfield, wireline to wireless and customers to their goals. Find out more at 3M.com/Telecom or follow @3MNetworks on Twitter.